Little Corn Island. Photo courtesy of Jagal. On a trip around Central America in 2005, Leila Kalmbach spent time on Little Corn Island, a dot of land just over 1 square mile off Nicaragua’s Caribbean Coast. The island is only accessible by a half-hour boat ride from Big Corn Island, and at the time only half the island had electricity, so it saw very few tourists. It did, however, get some semipermanent squatters, such as Peter Pan’s Lost Boys. The Lost Boys, as we’ve started referring to the group of Miskito lobster fishermen who are camped next door for the off season, are not around, so the beach is empty. Della reads her 600-page biography of Charles Dickens in preparation for her thesis next year; I revel in reading fiction, as I’ve just graduated from our small liberal arts college. I’ve spent the last year researching and writing about false memories — reading and rereading past research, running participants in an experiment, analyzing data and writing up conclusions — everything done with precision and care. The day after my graduation, we left to spend the summer backpacking around Central America, and after the frenetic pace of school, it is both luxurious and unsettling to have uncharted hours stretch out around us — neither of us even has a watch. After a while, Della suggests we start dinner. “Already?” I say, but she’s right; the sun is making a beeline for the horizon, and it will be next to impossible to cook by flashlight. There’s no electricity on this side of the island — in fact, our hut is nothing more than a sandy floor and a bed, covered by a bamboo roof that offers no protection when it rains — but it is cheap. We gather together the few ingredients we’ve lugged across the island from the dusty one-room shop — dried pasta, garlic, tomatoes and a packet of tomato sauce. We’re not excited, but it will do. We investigate the rudimentary kitchen, a standalone hut with a few crusty implements and a gas burner. Luckily, the water’s back on now, so we put some on to boil for the pasta. Mosquitoes swarm around us as we try to chop garlic with a butter knife. I’m afraid to speak for fear of ingesting mosquitoes. “Hellooooooooo,” comes a call from behind us. And there are a couple of the Lost Boys. “We been fishing,” Johnny says in his musical Miskito accent. “Come eat with us. We making soup.” Johnny has muscles that are strong from many years of physical labor and a gut that puffs out from many years of beer. His clothes seem to be an afterthought — stretched-out collar and dark black skin peeking out through the holes — yet he carries himself with pride. I don’t want to go. We’re already cooking; we have a plan. And as boring as our pasta sounds, fish soup sounds unappealing. But I’m not sure how to say no, and Della is always up for socializing, so we gather our ingredients together, garlic still only half sliced, and head next door. The other Lost Boys are there, smoking and drinking and chopping ingredients. They greet us enthusiastically. Like Peter Pan’s Lost Boys, these men are scruffy and mismatched, ambiguously aged between teenage and their late 50s, a rainbow of skin colors all darkened by the sun. They spend eight months a year on the lobster boats, they’ve told us, and the other four wherever they like. Some years they go to Costa Rica, where many of them are from, other years to various Caribbean islands. This year, they’re crashing in the hammocks outside the huts next door to our own. The owner lives on the mainland, they tell us, so she’ll never know. They don’t explain further. The man who seems to be the leader of the group, who looks like Captain Hook, positions a huge cauldron of water over the fire. Other men’s rough hands are shiny from cleaning fish, which they then toss in the cauldron. Everyone speaks a mix of Miskito, Spanish and English. Hook sees our bag and demands convivially, “What you bring?” We show him. “Good, good,” he says, smiling a crooked smile. He takes the pasta and the garlic, twisted up in a piece of plastic, and heads toward the cauldron. “It’s not all the way chopped yet!” I say, but he doesn’t understand me and dumps it all in. He comes back with a knife for the tomatoes. “How do you want them?” I ask, used to playing sous-chef to finicky college students, but he waves a hand dismissively. I start to dice the tomatoes into even chunks. Soon, the smell of a hot day on the beach — sweat and salt water and that ever-present tangy smell from the rotting mangoes — mixes with new scents: broth bubbling with fish, and tomatoes oozing seeds from under my knife. Johnny comes over with three young coconuts he’s just gotten down from the trees. I’d never seen anyone shimmy up the tall, straight trunk of a coconut tree before, but Johnny does it barefoot and while holding a machete in one hand to cut the coconuts down. He cracks them open with the machete and lets the juice drain out into the soup. We get to work on making coconut dumplings: He pries coconut pieces out of their shells with a pop, and I grate them. Nearby, Della is cutting up breadfruit with the machete she’s brought with her on our trip. She’s telling a story to one of the Lost Boys, and she talks energetically with her whole body. I smile. She is small and blonde and beautiful and fierce. Johnny pours some water into the grated coconut. We squeeze and mix the pulp until it turns milky, and he asks me about my scuba class. He laughs when I mention all the equipment we use. I am shocked. “You just hold it there on your back?” I ask. “Yes, hold it,” he says, “and with the other hand …” and he makes another motion, this time like spearing a fish. We start taking handfuls of coconut pulp out of the milk and discarding them, and Johnny adds in flour. He begins shaping balls of dough and tossing them into the cauldron. Some fall into the sand, where they’re snatched up by the homeless dogs that have been sniffing around. “How big are you making yours?” I ask, trying to see the ball of dough in his palm. “No matter!” he says, laughing. “You make it how you like. See?” He rolls a large ball of dough, then a tiny ball, and tosses them into the cauldron. “Or this.” And he rolls out a snake of dough between his palms, then pinches it off into short bits and long bits, and tosses them all in. Coming from a culture of uniformity in cooking, this method strikes me as a revelation. There are no timers here, no right and wrong ways to do things, no ingredients that should or should not be added. Here, life is all about doing things your own way and at your own pace — having fun with the process instead of worrying about the details. I experiment with the dumplings, making rings and figure-eights that probably get misshapen the moment they hit the water, but I don’t care. And when we taste the soup, I know that this is the way to cook. It is the most delicious meal I can remember, creamy and hot and more than anything, fresh. Aside from the ingredients Della and I brought and a few cubes of bouillon, everything has just been gathered from around the island: the breadfruit, the fish, the coconut, and some plants and herbs I don’t know. We all sit around together, feet in the sand, eating and laughing, just as we were while cooking. I know that I’ll never be able to re-create this soup, just like I’ll never be able to re-create this moment, and that’s okay — I’m enjoying it fully enough as it’s happening. For dessert, Captain Hook has gathered a huge bowl full of small mangoes. “What’s the number of mangoes you have eat in one sitting?” he asks me. “Three?” I guess. “Four?” I really love mangoes. “Three!” he scoffs. “I eat maybe twelve or fifteen. Here, see how many.” He passes around the bowl, and we all dig in, trying to break our records. If we run out, no worries. This island has a mango problem, and we’re happy to help. articles about the island life are always so fun! 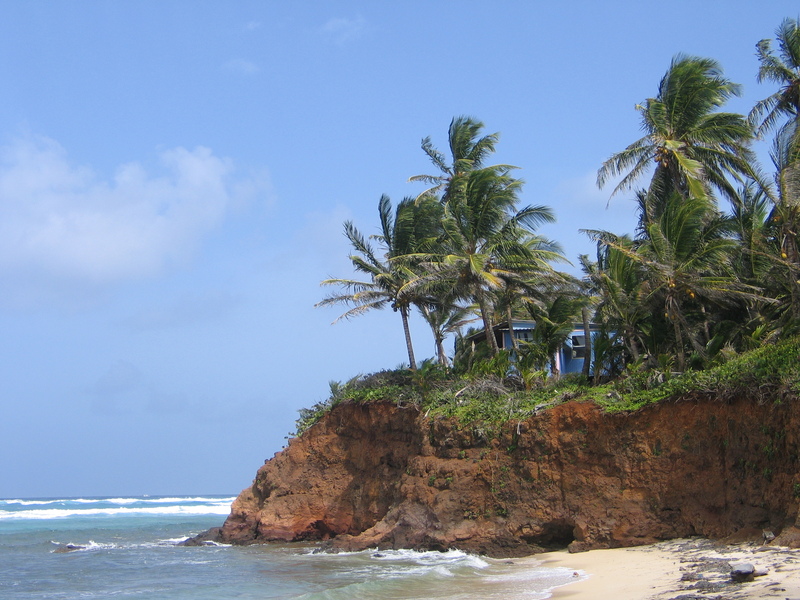 Little Corn Island looks beautiful in the picture. I wonder if it will ever be developed? Thanks for sharing. Hi Anita. I’m guessing it will be developed, unfortunately — I’ve heard that Nicaragua in general is getting more popular as a tourist destination, and even when I was there, half the island seemed to be in the midst of (a very small amount of) development. I’d be curious to go back now, as I bet it’s changed quite a bit in the last six years. Thanks for your comments! Great story!! I gotta get there soon!